What in the World Is Faith Promise Giving? 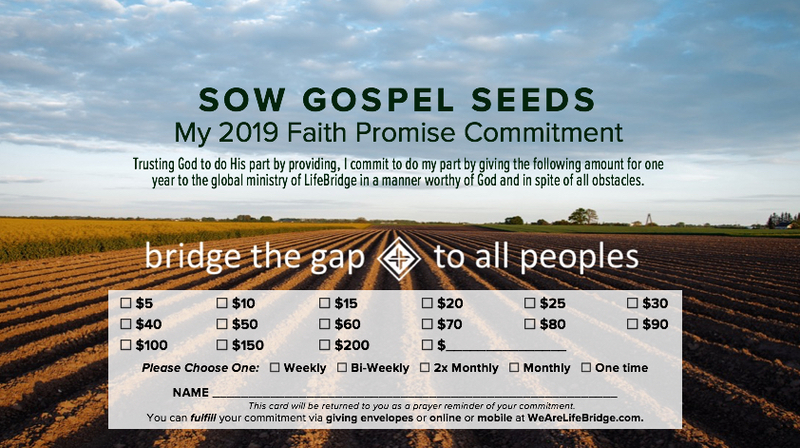 Here at LifeBridge we call giving to the cause of world missions “Faith Promise Giving,” because it is an accurate description of what we are called to do. Let’s work our way back in order to move forward in our giving to the Great Commission. Faith Promise Giving is simply a way to glorify God by giving to world missions over and above our tithe through our local church. By doing so, we partner with God and His missionaries in making Jesus known for the joy of all peoples. Faith Promise Commitment for the 2019 Year. But it is never too late to start giving to God's global purpose through LifeBridge!